What is L2TP VPN Service? In computer networking, Layer 2 Tunneling Protocol (L2TP) is a tunneling protocol used to support virtual private networks (VPNs) or as part of the delivery of services by ISPs. It does not provide any encryption or confidentiality by itself; it relies on an encryption protocol that it passes within the tunnel to provide privacy. Published in 1999 as proposed standard RFC 2661, L2TP has its origins primarily in two older tunneling protocols for Point-to-Point communication: Cisco’s Layer 2 Forwarding Protocol (L2F) and USRobotics Point-to-Point Tunneling Protocol (PPTP). A new version of this protocol, L2TPv3, was published as proposed standard RFC 3931 in 2005. L2TPv3 provides additional security features, improved encapsulation, and the ability to carry data links other than simply PPP (PPP) over an IP network (e.g., Frame Relay, Ethernet, ATM, etc.). The entire L2TP packet, including payload and L2TP header, is sent within a User Datagram Protocol (UDP) datagram. It is common to carry PPP sessions within an L2TP tunnel. L2TP does not provide confidentiality or strong authentication by itself. IPsec is often used to secure L2TP packets by providing confidentiality, authentication, and integrity. The combination of these two protocols is generally known as L2TP/IPsec (discussed below). The two endpoints of an L2TP tunnel are called the LAC (L2TP Access Concentrator) and the LNS (L2TP Network Server). The LAC is the initiator of the tunnel while the LNS is the server, which waits for new tunnels. Once a tunnel is established, the network traffic between the peers is bidirectional. To be useful for networking, higher-level protocols are then run through the L2TP tunnel. To facilitate this, an L2TP session (or ‘call’) is established within the tunnel for each higher-level protocol such as PPP. Either the LAC or LNS may initiate sessions. The traffic for each session is isolated by L2TP, so it is possible to set up multiple virtual networks across a single tunnel. MTU should be considered when implementing L2TP. 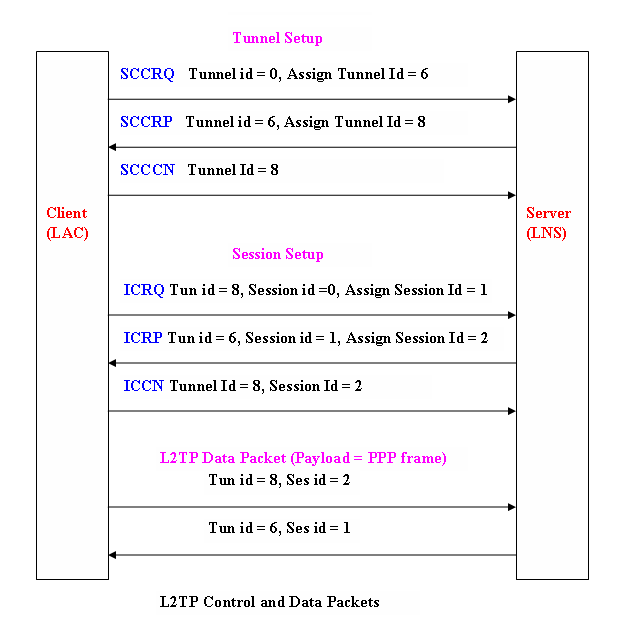 The packets exchanged within an L2TP tunnel are categorized as either control packets or data packets. L2TP provides reliability features for the control packets, but no reliability for data packets. Reliability, if desired, must be provided by the nested protocols running within each session of the L2TP tunnel. Click on this link to see how to setup VPN on your computer and smartphone.